IEEE Spectrum has an update on the land required for solar power plants - Report Counts Up Solar Power Land Use Needs. 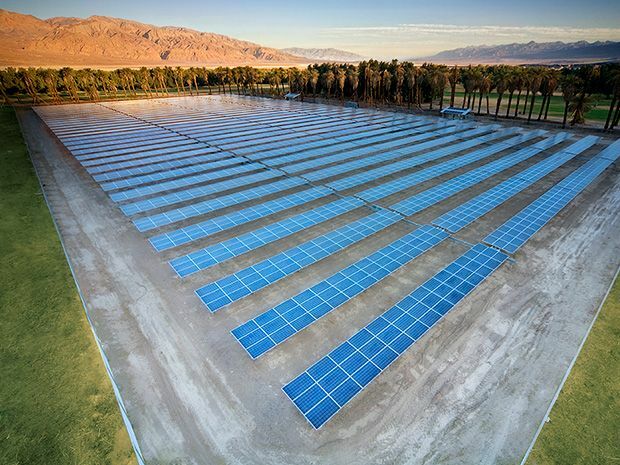 The report used land use data from 72 percent of all large solar plants installed in the U.S., and found that the total area requirements for a photovoltaic (PV) plant between 1 and 20 megawatt capacity is 8.3 acres per MW. For larger PV plants, the total area needed is 7.9 acres per MW, while concentrating solar power plants (CSP) need 10 acres per MW. When weighted by generation rather than capacity, the larger PV plants (3.4 acres per gigawatt-hour per year) and CSP plants (3.5 acres/GWh/year) do a bit better than smaller PV plants (4.1 acres/GWh/year). This isn't the first time NREL has looked at solar land use, though it is the first time they used a whole lot of actual power plants to figure out the numbers. In the past, they estimated that to power all of the U.S. with solar power, it would require 0.6 percent of all the area in the country. The new report says that a PV plant capable of powering 1 000 homes needs 32 acres. According to the U.S. Census Bureau, there are around 115 million occupied and fully used homes in the country. If we just scale up linearly (which is not, of course, how this would actually work), that means 3.68 million acres to power all of them. That's equivalent to 5 750 square miles, or around 0.1 percent of all the land the US has to offer.